Cambodia lightning fatalities are above normal for this time of year. Lightning struck and killed two people on two separate days in Cambodia during the week of 12 March 2017. According to police, the first incident occurred in Preah Vihear province. The victim was a 57-year-old soldier in the Royal Cambodian Armed Forces’ Intervention Division 3. The victim was working harvesting cassava on 12 March. Fast-forming storms in the northern region of the province caught farmers in Choam Ksan district off-guard. While many farmers took shelter from the storm in a building, the victim hid underneath a tree. Around 6 pm local time, a lightning bolt struck the tree and killed him. The second incident occurred on 17 March 2017 in Kamrieng district. Lightning struck a killed a 54-year-old woman around 4 pm local time. According to police, three other women sustained lightning-related injuries during the same storm. During a 10-hour period on 17 March 2017, we tracked over 4,000 storm cells through Cambodia. The cells were strong enough to generate 54 Dangerous Thunderstorm Alerts (DTAs). DTAs occur as strong storm cells move towards. Represented by purple polygons, DTAs point towards the area the storm is heading. The video below shows our cell tracks and DTAs in action. 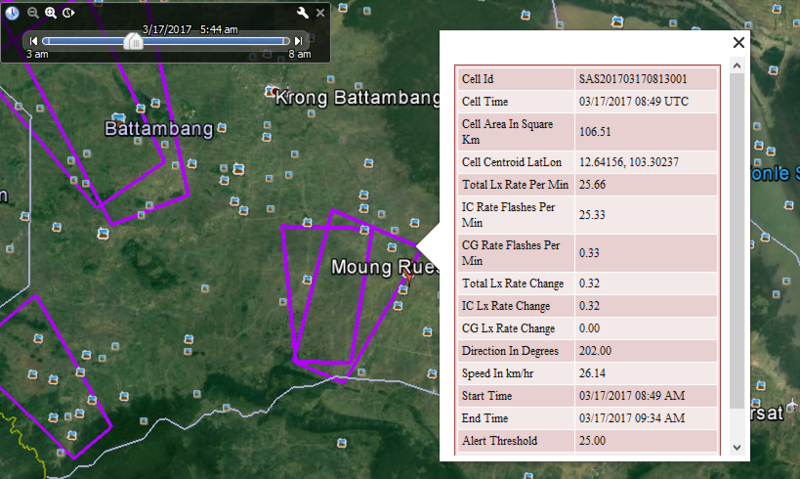 There were a number of DTAs that lined up perfectly with Moung Reussei district in Battambang province. We generated the highlighted alert below at 8:49 UTC. Since Cambodia is seven hours ahead of UTC, that means it was 3:49 pm local time – Ten minutes before the fatal strike. 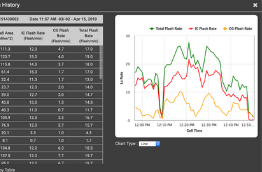 DTAs provide businesses with the fastest severe weather lead times. This is because our total lightning network detects both cloud-to-ground and in-cloud lightning strikes. Lightning in Cambodia, and throughout the world, comes in both forms. 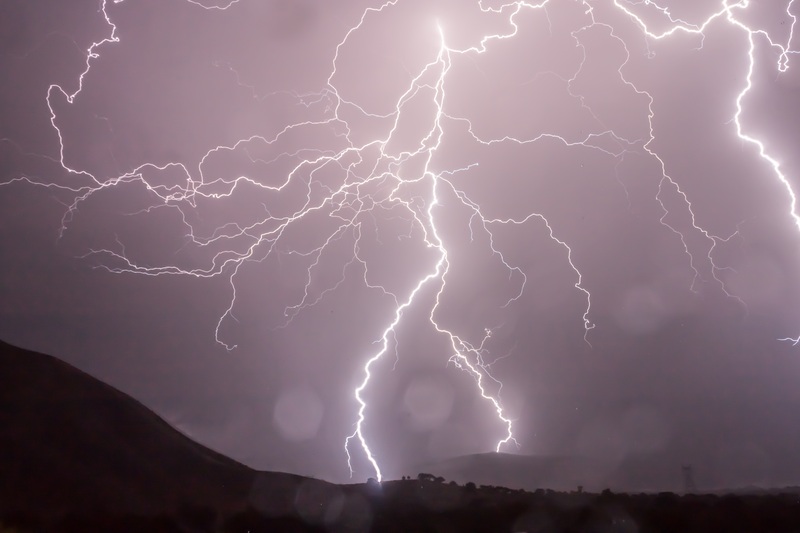 While cloud-to-ground strikes are the damaging ones, 80% of strikes are in-cloud. In-cloud strikes are so important to monitor because they are a proven precursor to dangerous weather conditions like cloud-to-ground strikes, hail, heavy rain and even tornadoes. It is common knowledge that standing underneath a tree is one of the worst things you can do during a thunderstorm. This is because trees act as natural lightning rods and often attract lightning strikes. 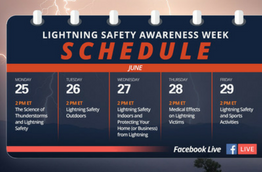 When people die from lightning strikes, it is often because there were too close to a tree that was struck. Disaster management figures show that lightning struck 213 people in Cambodia last year. Out of those 213 people, 108 died. The year before, in 2015, 107 died. 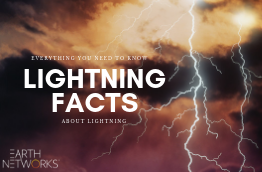 Lightning is a common killer in Cambodia, and their numbers could be lower if people, especially farmers, knew how to lower their risk of being struck.